American hostage Steven Sotloff has reportedly been executed by jihadist ISIS terrorist. Sotloff, aged 31 disappeared in Syria in August 2013. His abduction was not widely known until he appeared on a video released last month by ISIS. 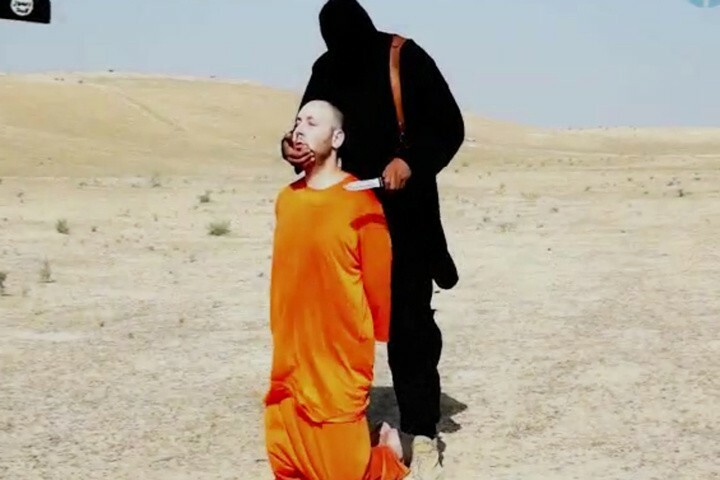 In the, now famous footage, James Foley is beheaded by the masked militant, then parades Mr. Sotloff in front of the camera, warning that he will meet the same fate unless US President Barack Obama ends air strikes against the jihadist group in Iraq. This brutal video shows Sotloff, wearing a Guantanamo-style orange prison uniform, kneeling in the desert, blaming the US President for the foreign policy of war and suffering. The jihadist warns that the longer that missiles rain down on his people, the longer knives will be held to the throats of Americans. Sotloff, aged 31, grew up in South Florida with his mother, father and younger sister. He majored in journalism at the University of Central Florida. He graduated from another college, began taking Arabic classes and subsequently picked up freelance writing work for a number of publications, including Time, Foreign Policy, World Affairs and the Christian Science Monitor. His travels took him to Yemen, Saudi Arabia, Qatar and Turkey — among other countries — and eventually Syria. The released video by the jihadists also threatens the life of British captive, David Haines.